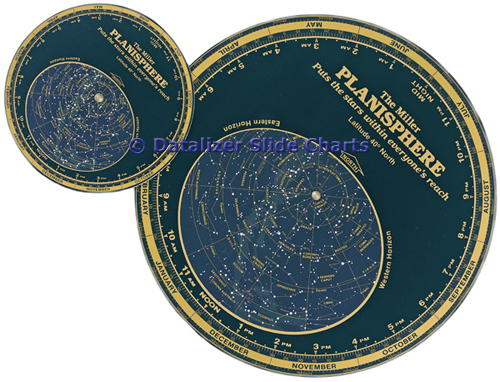 Miller Planisphere is the same elegant, all plastic wheel chart featured in the Smithsonian National Air & Space Museum shop. This interactive guide to the heavens displays the position of the stars for any hour, of any day, of any year. Simply align the time of day and the day of the year on the rotating dials, and the sky window displays exactly how the sky will appear at that time. Storage Pouch: Durable vinyl pouch with clear front. The Miller Planisphere can also be custom printed with your company information. Let us know what you need and we will provide a quote. "...like having a personal planetarium." "The definitive analog to the celestial expanse!" "...is unaffected by dew and moisture, so it will remain readable and useful for years to come." This stock item is available for immediate shipment. Each chart is shipped in a durable vinyl pouch.